Samsung Philippines surely never runs out of surprises for its loyal patrons, followers, fanatics and the like. Just few days after the introduction of its Galaxy A Series of 2017 to its media partners and influencers, here they go again to reveal their newest Brand Ambassador to this brand's latest smartphone line. The Bonifacio High Street B1 strip was filled with unsuspecting crowd which later on was slowly increasing the moment loud music has begun. It is because everyone was eager to know what kind of surprise awaits them. 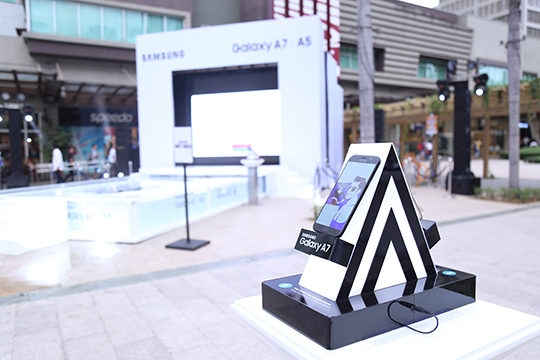 Then the action has begun with the Galaxy A Series 2017 being introduced to the public through a unique water and lights spectacle. It was then followed by a fiery performance of a world-class dance group GForce who made a splash (literally) on the stage’s pool of water as they danced. It was an innovative display running on high-octane energy and a lot of attitude – a perfect way to introduce the Galaxy A Series 2017, the smartphone with attitude. As evening fell, a large stage on Bonifacio High Street came to life with a water curtain and the much awaited bold entrance of our reigning Ms. International 2016, Ms. Kylie Verzosa was witnessed. The crowd hooted by her entrance wearing a bright blue chiffon gown which highlighted her best features truly owned by a queen. The audience stood mesmerized as Kylie gait subtly on the stage holding her piece of Galaxy A7(2017) and taking a selfie on any angle. Just like the Galaxy A Series 2017, Kylie is smart, stylish and always ahead of the game. Kylie best suits the title as its new ambassador as she’s also known for her winning ways even under pressure. It’s comparable to how the Galaxy A Series 2017 is packed with premium features that stand out, even when faced with the challenges of rain, sweat, sand or dust. She is constantly seeking to do more – whether as a beauty queen, a teacher, a corporate warrior, or as somebody who is ready to dive in and take on any adventure that life throws her way. As a model to many millennial, she embodies flexibility and she doesn’t settle for anything less than the best which is exactly how the Galaxy A Series 2017 is positioned in the market. For additional information, visit www.samsung.com/ph/ASeries2017 to learn more.